Shabby chic – a term most of us are now familiar with, was coined in the 1980s by an interior design magazine. The style originated in Britain’s country houses in the early 1900’s, when the economic state of affairs meant that people were less able to spend money on the up keep of their stately homes, leading to faded and tired interiors. Popularity of the style probably started in the late 1970’s with the modern bohemians and it has certainly been top of the interior fashion stakes for a number of years now. In 2014 eBay reported selling over 3000 shabby chic items every day. The term essentially refers to old furniture which is showing signs of wear/age; often with many layers of paint and those underneath showing through; sometimes this can be natural aging but at other times items are distressed after purchase using various techniques. It is a kind of romantic, French chateau, relaxed, cottage style mainly using white and pastel colours, with a popularity of the rose print (think Cath Kidston) though Italian influence has led to a greater diversity of bright colours. Some of this popularity has been down to our general fascination with vintage. Once celebrities began wearing vintage fashion, old suddenly began to be equated with fashionable. Television has also played a role through the period dramas it shows. The internet has made finding vintage items far easier than trawling local charity shops –although find the right area, and the charity shops and markets, can still furnish you with very original pieces along with being an amusing way to spend an afternoon. Another influence on the growing popularity of shabby chic has been the awareness of sustainability with a drive to recycle as well as upcycle. With recycling, an item is broken down into its parts and then made into something different whereas upcycling is simply renovating the original item. 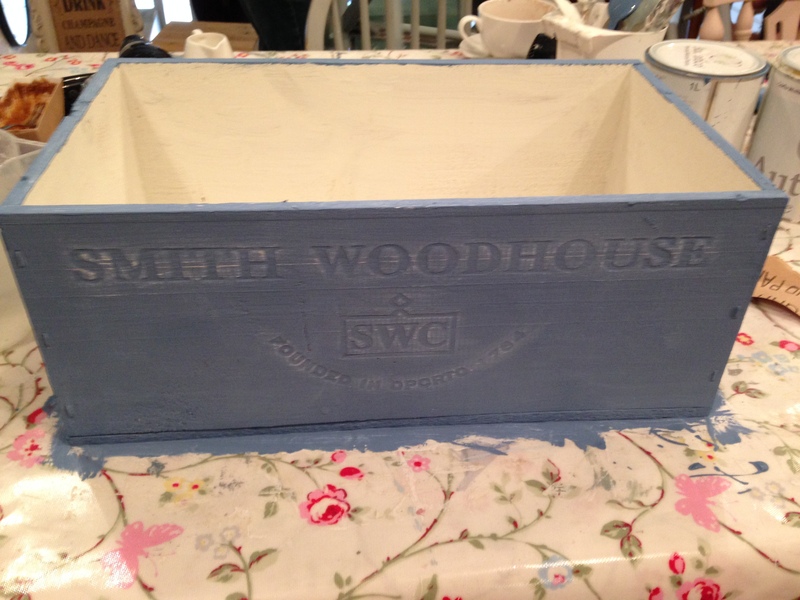 One Sunday this month, I attended a beginner’s furniture painting class at The Vintage Dove in Rainham, Kent. I want to upcycle a dining table and chairs but was reticent to try without some advice and practice. The class was £55 for 4 hours which I thought was very reasonable and we had to bring a small piece of furniture with us. 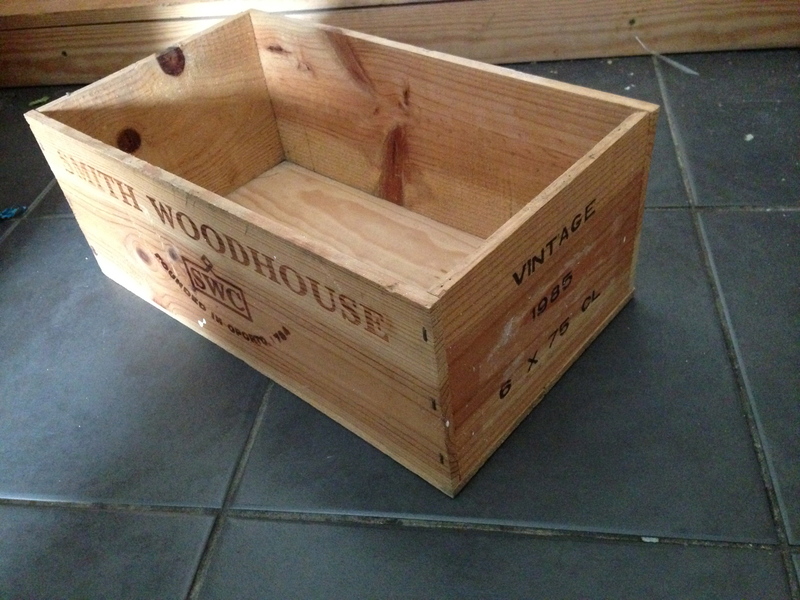 I took a vintage wine crate which we found in the shed. 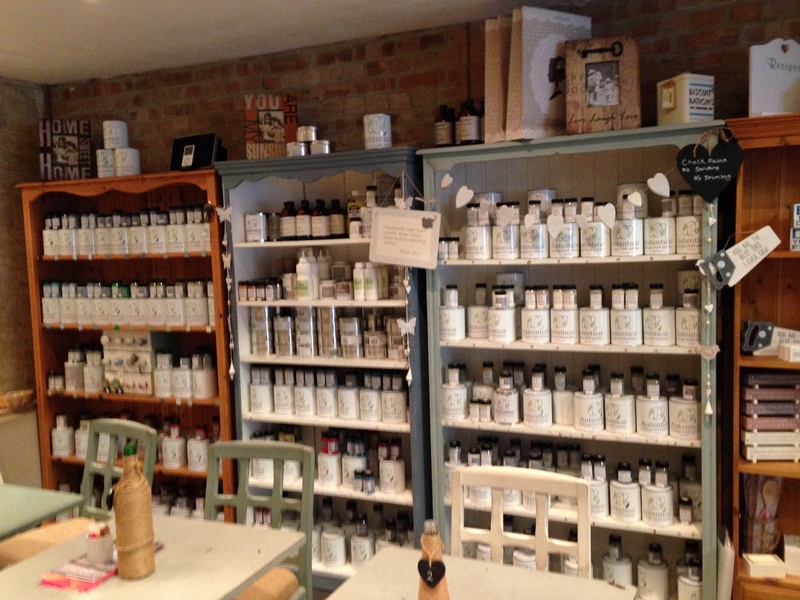 The shop is inviting as soon as you walk through the door, with a country cottage feel. It is split over 2 levels and has a lovely range of home accessories, small furniture items and gifts. The shop is a specialist in Autentico products with a comprehensive range in stock and the option to order others. If the thought of painting Granny’s dresser is all too daunting – they will also paint items for you for a fee. Stephanie, the owner of the shop welcomed us with a much needed coffee before explaining a bit about the range of Autentico paints which they stock. 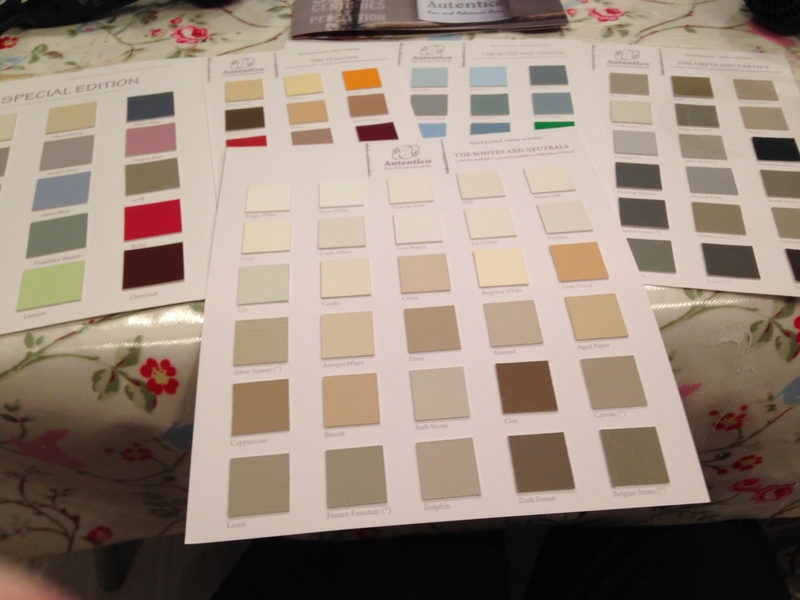 Autentico are chalk based paints which come in a number of finishes and a multitude of colours. The paint is water-based and made with natural ingredients. It will stick to almost any surface meaning that there is no need for extensive sanding and primer before applying it. The only preparation required is to clean your surface with sugar soap. 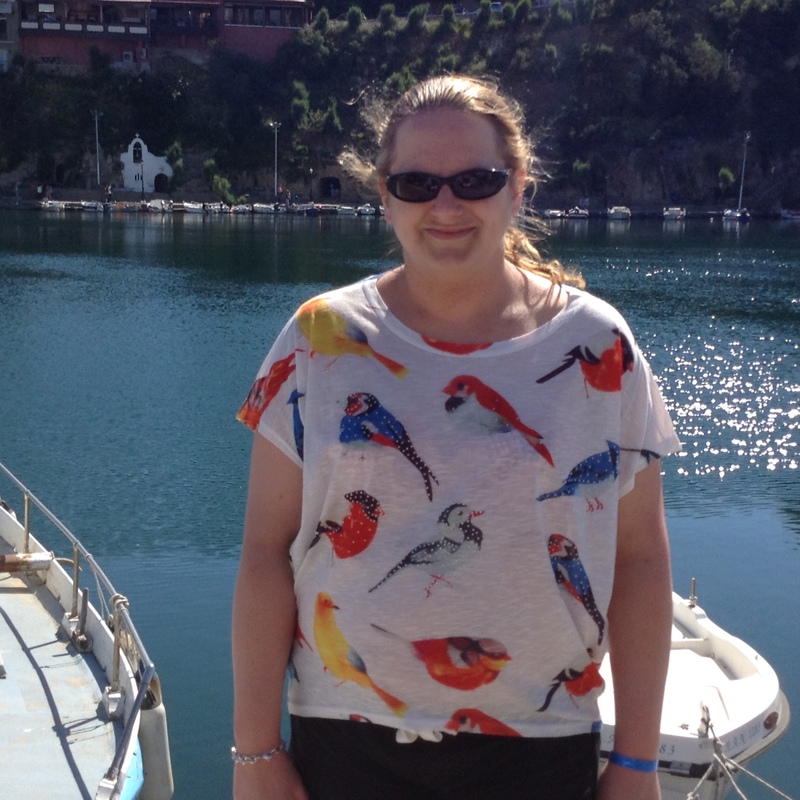 Picking from the 140 colours proved difficult for the four of us that attended but as I had just been to Crete – I picked a shade of blue called Crete and a white called Corfu white. Stephanie advised us to paint in only one direction to avoid rubbing off what you had just painted and also to paint from the middle out so that you didn’t end up with a big blob of paint on the edges. The painting was actually very therapeutic and I can see how it can become addictive. Stephanie explained how the shop had been born; simply when she couldn’t find a suitable dressing table for her daughter, so got an old one to upcycle and has been painting ever since. She commented how lucky she is to have a job she loves and her enthusiasm is certainly infectious. When I had painted the box white all over and dried it off with a hairdryer, I then set about painting the outside of the box blue. Once this was thoroughly dry – Stephanie explained the different methods of distressing, these are dragging a wet sponge over areas you want to look faded; dry brushing which is generally used when you have a light base coat and you then dip your brush in a darker colour – dry it off and then drag it over the item. The final method was to use very fine sandpaper on the edges and other areas that would be likely to show signs of wear. I went with the sandpaper option and just used it to highlight the engraved wording on the box. The box was then finished with a coat of wax. Stephanie also gave us a preview of the things you would learn on the advanced course and I will certainly be back for more! This follow on course looks at paint effects such a crackling and applying transfers. I really enjoyed my day and would highly recommend the class to anyone with an interest in vintage furniture. The class was accessible and fun and was a small number of people so you got plenty of opportunities to ask questions and get some one on one tuition. I will be trawling eBay, the many charity shops in Rainham and the pop-up shop behind the White Horse pub in Rainham for future pieces to work on. Happy upcycling! 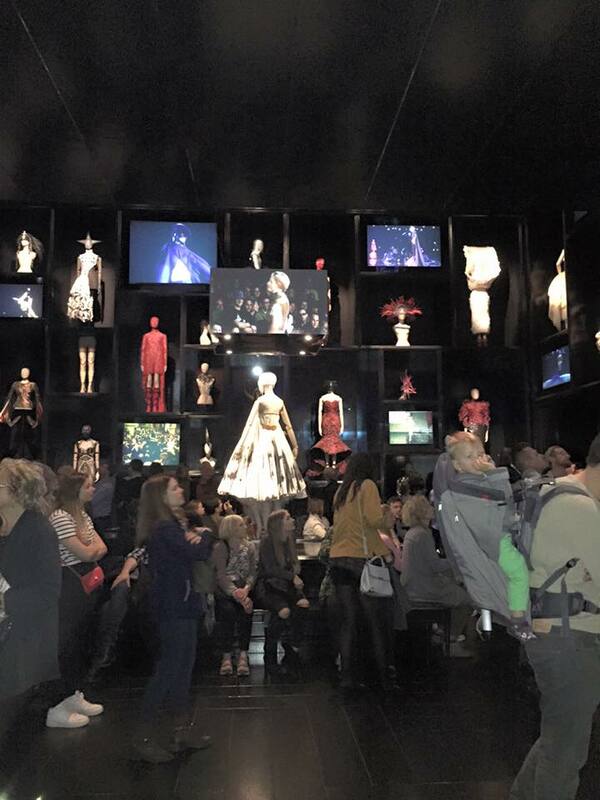 At the end of May, my friend and I visited the Alexander McQueen exhibition ‘Savage Beauty’ at the Victoria and Albert Museum in South Kensington. In Europe, this is the first and largest retrospective display of his work. Before attending the exhibition, my knowledge of him and his designs was fairly limited although I knew of his infamous signature skull scarves. 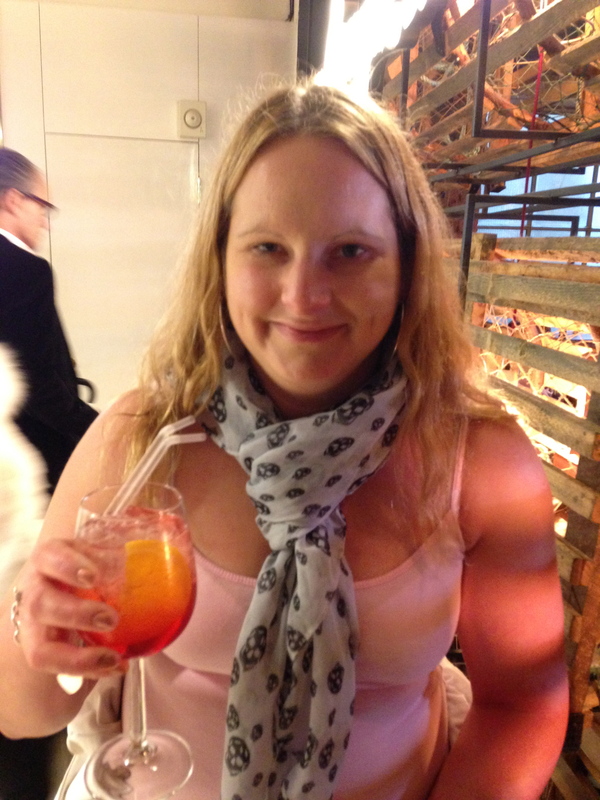 Sadly I couldn’t afford a genuine scarf and even if I could, I’m not sure it is really my style but I managed to find a cheap version in Torza boutique in Petts Wood so wore this to the exhibition as my tribute to his work and influence on the fashion world. Alexander McQueen was born in Lewisham in 1969 and was the youngest of six children. His father was a taxi driver and his mother, a teacher. He began his career as an apprentice at a tailor’s on Saville Row and once said ‘I spent a long time learning how to construct clothes, which is important to do before you can deconstruct them’. His tailoring skills were exceptional and he went on to study an MA in Fashion at London’s Central St Martin’s. He used revolutionary cuts which led to his famous ‘bumster’ trousers in 1996 which were cut provocatively low. At the exhibition I was quite taken by a simple smart pair of smart black trousers which had large turn ups secured with buttons – I’m thinking I might try to copy these if my sewing skills are up to it, or should I say if Mum’s are! Isabella Blow, an influential fashion designer bought his entire graduate collection. He went on to be chief designer at Givenchy and established his own label. He gained a CBE and won numerous fashion awards. He hung himself 9 days after his mother’s death, having taken an overdose. He was a huge loss to the fashion world and tributes flooded in. A memorial service was held at St Paul’s some 7 months after his death and more than 2500 stars including actresses and models were invited, including my idol, Sarah Jessica Parker. Many of his designs I find too outrageous – not that I could afford them anyhow, but I would love to own a pair of his shoes from his fashion house’s newest collection which are pictured below. No one can deny that his ambition to be remembered as starting the fashion of the 21st century, was realised. His designs were extremely influential and often challenged societal views. As he himself commented ‘you’ve got to know the rules to break them.’ His work was more art than fashion and he frequently chose to juxtaposition things to show there was beauty in the ugly, hence the exhibition title ‘Savage Beauty’. His work would paradoxically place death and life, happiness and sadness etc. His fashion tended to be expressive of his own fluctuating mood and sometimes a little on the risqué side in its provocative nature. He was strongly influenced by Victorian gothic, Japan and Scotland. There was a whole range of Tartan at the exhibition, some of which had Victoriana lace embellishments. The exhibition was a mix of his clothes, shoes and accessories as well as recreating some of the theatrics that had been seen at his fashion shows in the past. There was one room with bones adorning the walls and it contained outfits made of leather, pony skin and even a top with crocodile heads on the shoulders. Another room contained shelving with clothes, shoes and accessories interspersed with TV screens showing the catwalk shows and in the centre of the room were seats to sit and soak up the atmosphere as well as the strapless white dress which was famously jetted with black and green paint by robots as the model twirled on the stage at his spring/summer 1999 show; the audience had seen fashion being created before their eyes. Another room has a smaller version of the prism with a floating ghostly hologram of Kate Moss that was the finale at the Paris 2006 show which is accompanied by some very moving music from the film Schindler’s List. 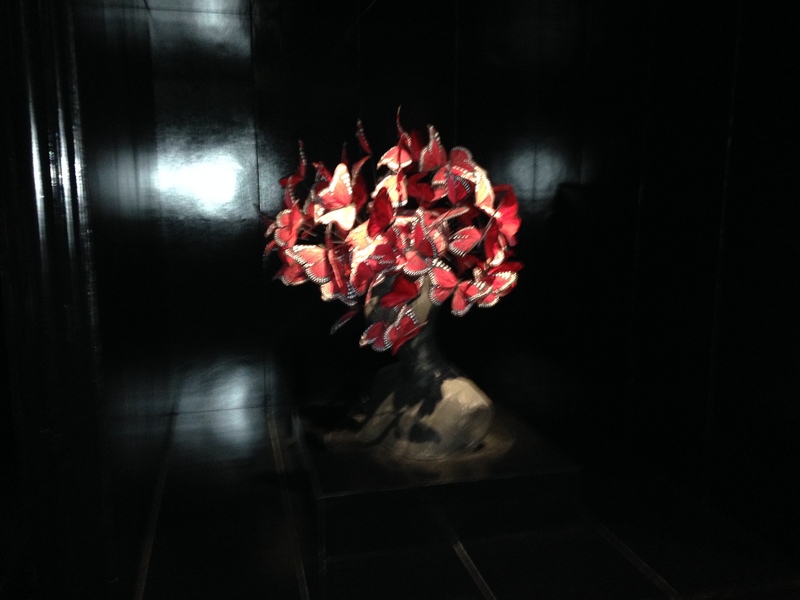 One of his other dramatic displays, the glass box which was part of his VOSS collection in spring/summer 2001 was recreated at this exhibition. There was a two way mirrored box which at the start the audience can see the reflection of themselves in. The show then begins and reflections can no longer be seen but the models we can see can’t see out of the box. The display finishes with an obese woman apparently hooked up to life support and there is the errie bleeping of a hospital machine. 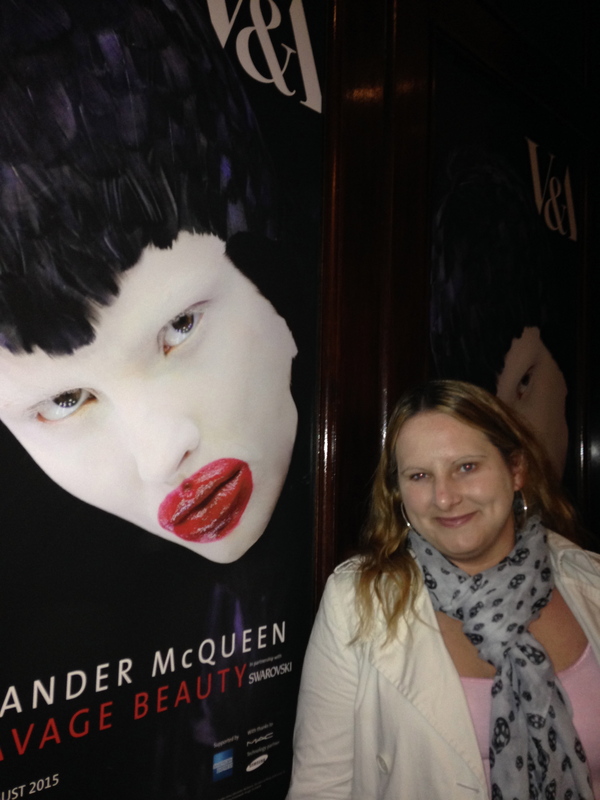 McQueen was again challenging our ideas of what is beautiful and suggesting that beauty is within us all. He was greatly influenced by nature and this was probably his most enduring theme. Perhaps he saw Mother Nature as the greatest of designers. He used prints based on sea creatures in his Plato’s Atlantis spring/summer 2010. 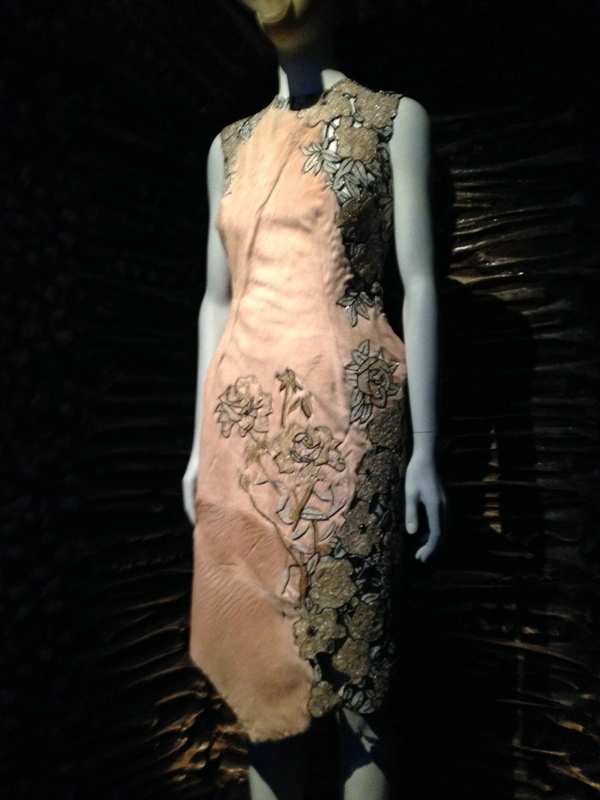 Another very intricate piece was a coat made of duck feathers which were painted gold. 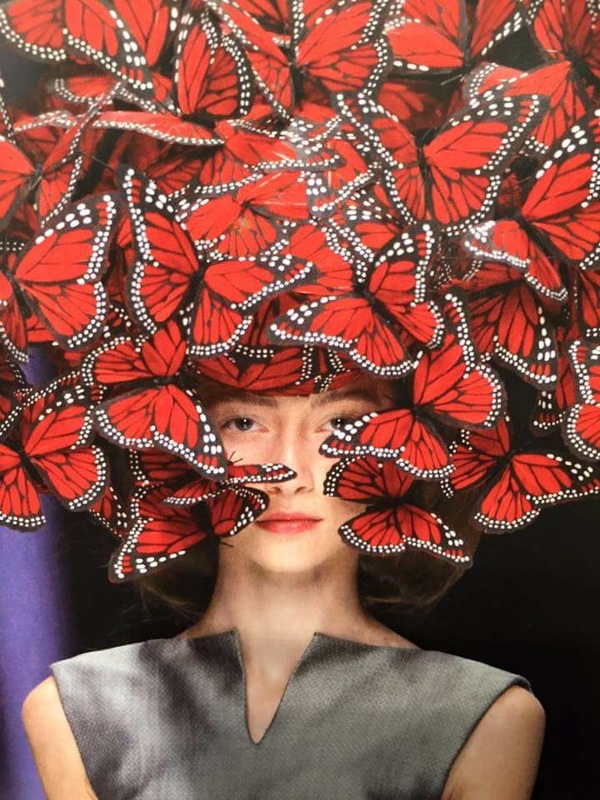 My favourite piece in the entire exhibition was a butterfly headdress made of hand painted turkey feathers for spring/summer 2008 which was a result of his collaboration with Philip Treacy. 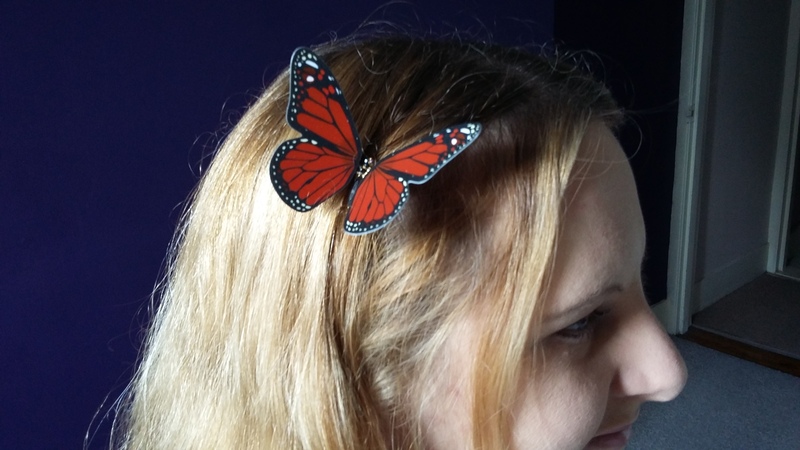 In the shop at the museum I bought a hairclip which is a replica of one of the butterflies. 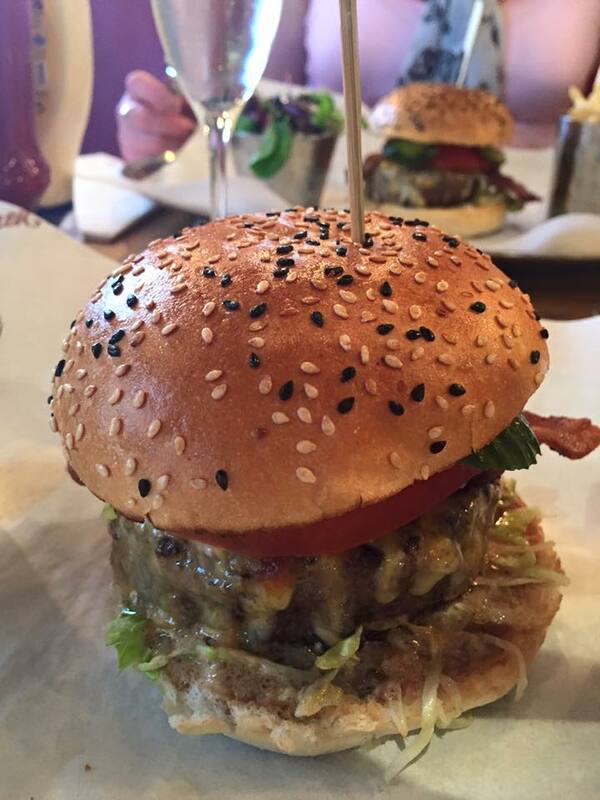 My friend and I finished our day with a visit to the 5th floor of Harvey Nichols where we enjoyed a cocktail and then headed to Burger and Lobster. I have never been to this restaurant before and as the name suggests, the only choices on the menu are burger and lobster. Whichever of these you chose, the price is £20. This does seem rather steep for a burger but I have to admit it was one of the best burgers ever. The waiter indulged us with a free glass of Prosecco each to celebrate my friend purchasing a new home. It was a true day of luxury. 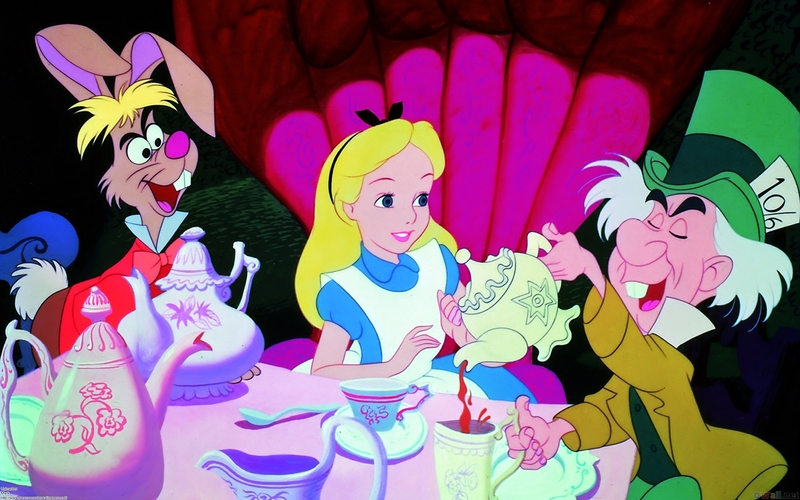 This year marks the 150th anniversary of Alice in Wonderland. The book, written by Lewis Carroll, allegedly for a friend’s daughter after he told her the story on a river trip; was first published in 1865. 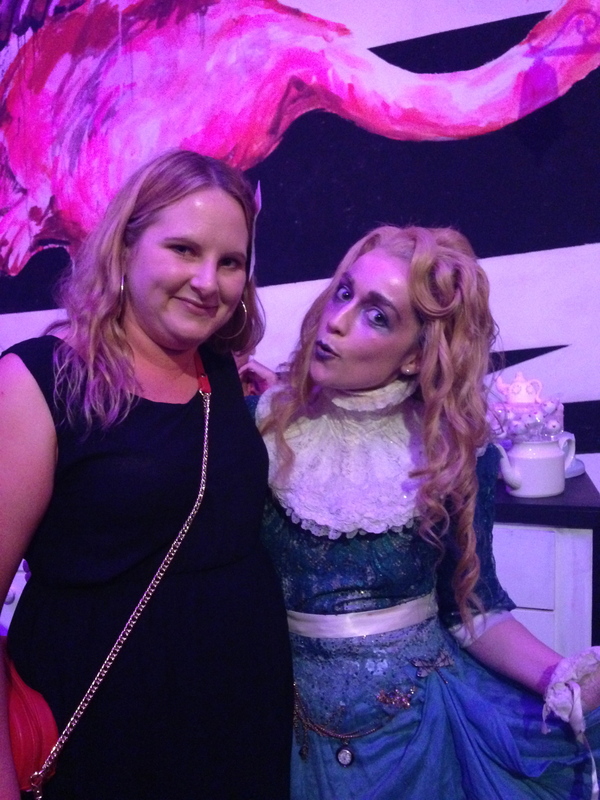 It was followed up by Alice through the looking glass. The story has been translated into many languages and there have been numerous film and play adaptations of it. The most famous adaptation are the Disney cartoon version, released in 1951 and the version from 2010 starring Johnny Depp. Some critics have tried to claim the magic of wonderland is simply the description of someone on a drug induced trip – however whatever the inspiration, wonderland is a fantastic fantasy world which has grabbed the imagination of children in the past, today and probably will for many years to come. 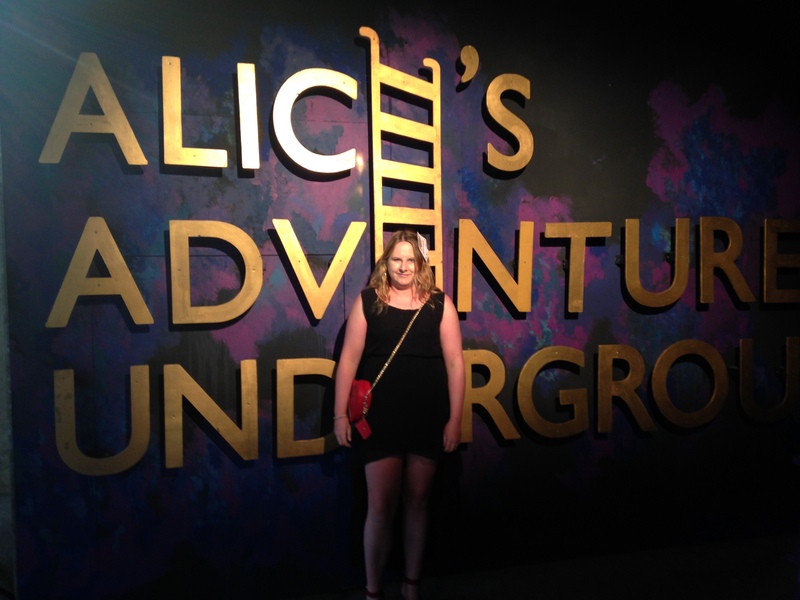 To celebrate this wonderful nonsense story where nothing is as it seems– there is an interactive theatre show called Alice Underground being held in the Vaults at Waterloo. 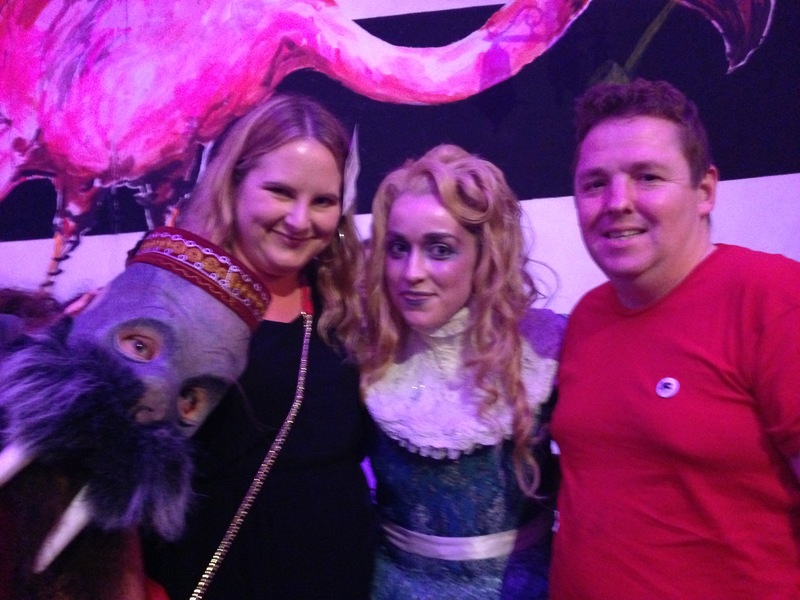 The director, writer and producer of the show advises ‘growing old doesn’t mean growing up, embrace the nonsense, leave your adult at the door and join us for a while in Wonderland – we’re all mad here.’ My husband and I visited last month and it was a fantastic experience. WARNING – If you plan to visit – I would advise you not to read any further as this blog will give away a lot of secrets and spoil the suspense and therefore the experience which is what the producer wants you to focus on. Guests were instructed to come dressed in red and black for the Queens Court but sadly less than 50% of people took this advice so perhaps the effect was not quite as the producers imagined. I wore a black dress from New Look and accessorised with red suedette heels also from New Look and a red heart bag by Floozie which I got in the Debenhams sale. 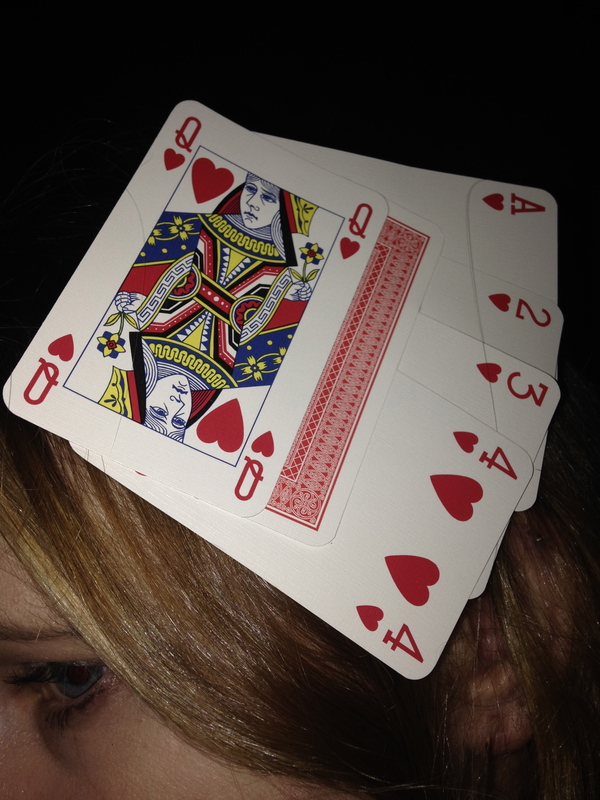 I also made a fascinator out of heart suit playing cards. The white rabbit commented on it and left me ‘in charge’ at one point because of it! The show begins in a room full of various curios – there are book cases that are crooked, a writing desk, a mini dark room and most importantly a mirror. When you look in the mirror – a hologram of Alice appears. You are left in this room just long enough to wonder exactly what you have paid to see, before there is a bang and one of the bookcases opens to reveal a passage way covered in pages from books. You are then in a room of mirrors and the ceiling begins to spin – giving you the feeling of falling down the rabbit hole. 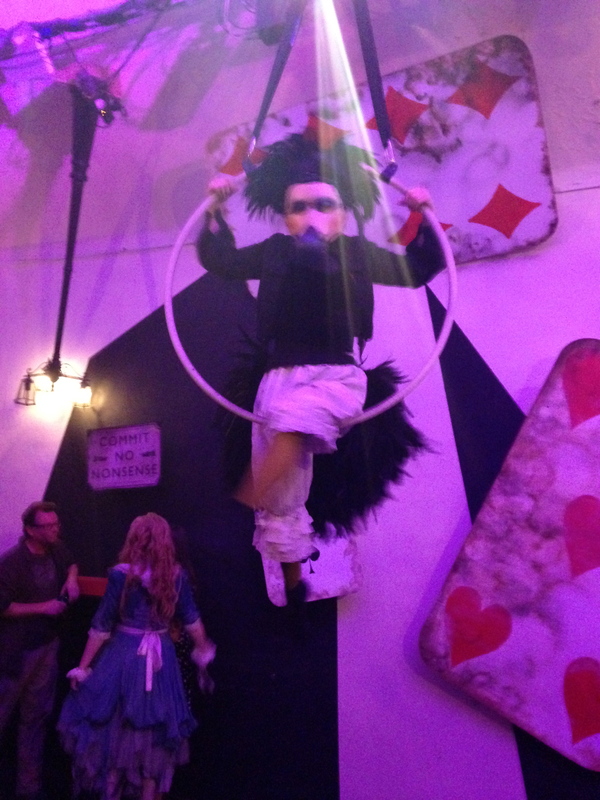 Next you are faced with a giant chessboard with a door on either side and you are introduced to the white rabbit. The white rabbit explains that you can either go through the large door or the small door and you are to select either the ‘eat me’ or the ‘drink me’ option depending on which you want. As the book says ‘if you don’t know where you are going any road can take you there’ and as such we chose the drink me and therefore the small door. This leads through to another area where you are given your Wonderland identity cards which determine which suit you are in. The rabbit then checks the coast is clear (when he left me in charge) before taking you into a dark room where you are entertained by the Cheshire cat. At that point we were split according to the suit on our cards. I was nervous to be separated from my husband as by now, I really did feel like I was Alice; entering a strange world where anything could happen. We began in a room full of looking glasses which the resistance were hiding since the Queen had banned them in the kingdom. In one mirror we once again saw Alice but not as a hologram this time. She was musing on how she got there and who indeed she was. Next we found ourselves in the kitchen, helping with the cooking. The Duchess holding a sneezing baby pig had makeup on which really frightened me and the chef kept making sudden loud bangs of the rolling pin. Following that was a room with a knave who had been trying to paint the roses red as the Queen would be annoyed they had got white ones by mistake. They needed us to help them try and magic the brush clean. 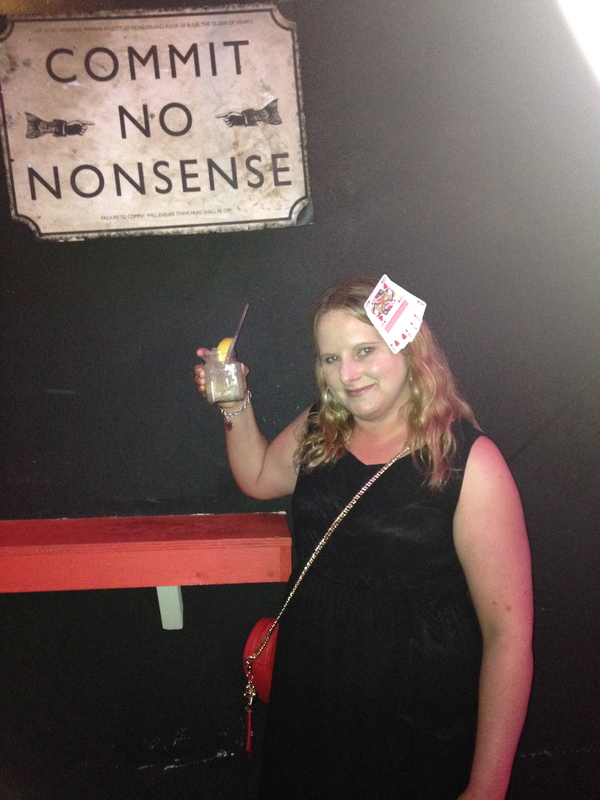 We were then in a room with another member of the Wonderland resistance (the queen had apparently outlawed nonsense). We were given a party whistle and told to blow it when the answer to the riddle ‘Why is a raven like a writing desk’ was revealed which it was, later in the court room. Subsequently we were taken to see Tweedle Dum and Tweedle Dee who were suspended from the ceiling and jumping around whilst trying to read; we made a swift exit as one of them announced they were about to be sick. Lastly was my favourite room. We all sat on cushions on the floor whilst the caterpillar told us a story in between him drawing on his shisha pipe. Projected on the ceiling was a kind of image which perhaps represented his thoughts or a dream. My only criticism of this room was that the people operating the caterpillar could have been more discreet. All the suits were then reunited to sit at the table for tea. I had wine in a tea cup and we listened to the mad hatter and others talk in riddles about such things as it always being tea time and jam tomorrow and jam yesterday-but never jam today. After tea we were escourted in to the court room and organised by suit, whilst the queen of hearts tried to ascertain who had stolen her jam tarts. It turns out my husband’s group had. The story ends with Alice saving the day and the queen being put behind the looking glass. We ended the show in the Queens bar where you got to meet the cast and try some gorgeous cocktails served in jam jars. Incidently 6077 jam jars were needed for this! It truly was a magical experience, like entering a dream world and certainly gave me a new appreciation for the text. 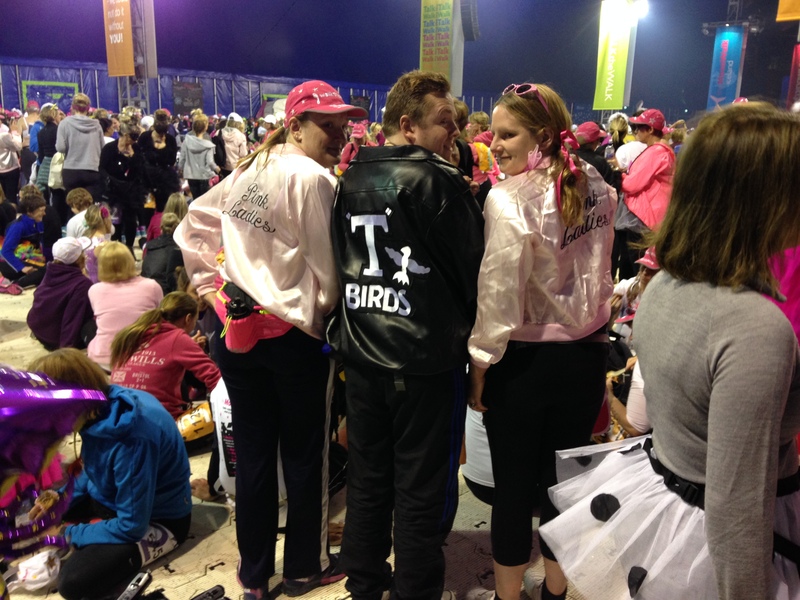 Some people celebrate their first wedding anniversary with a posh meal, others with a holiday – we chose to complete the London 2015 Moonwalk! 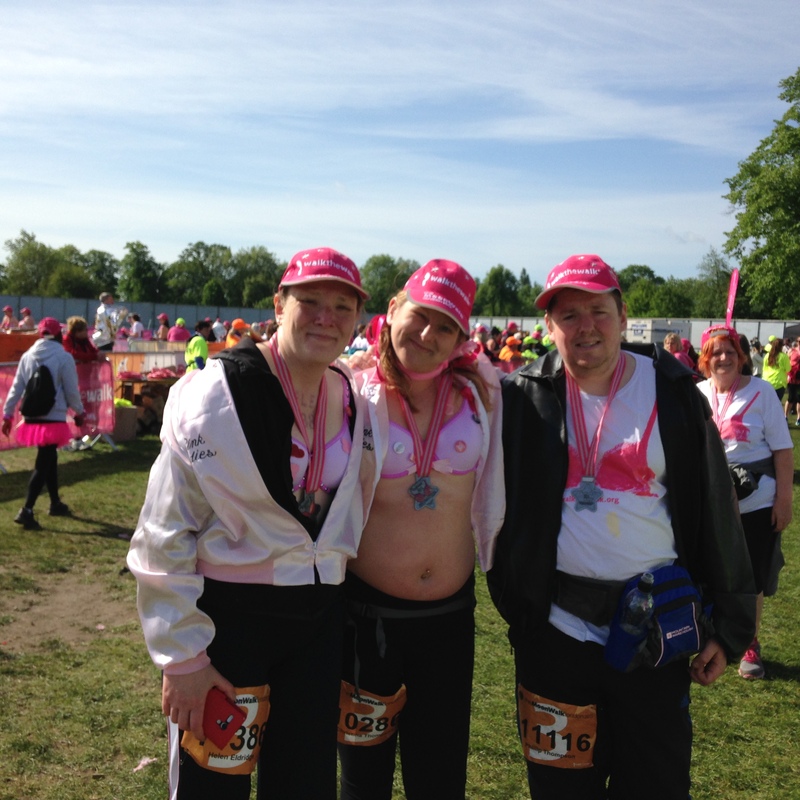 Our team of three; my husband, his sister and I completed the 26.2 mile walk around London overnight on 16th/17th May to raise money for breast cancer through the charity Walk the Walk. We named our team Paper Chase in honour of our wedding anniversary being that paper is the gift most commonly associated with the first. The celebration of wedding anniversaries finds its origins back in the Roman Empire when wives were crowned by their husbands with a silver wreath to denote 25 years of marriage or gold for 50. In the modern day, different gifts are now associated with each anniversary. The origins of this appear to date back to 1922 with the publication of Etiquette by Emily Post in which symbolic gifts were identified for 8 milestone anniversaries. Mainly due to commercialism, there are now gifts associated with years 1-15, 20, 25, 30, 35, 40, 45, 50 and 60 of marriage. The meaning of the first being paper, is believed to relate to the fact that the marriage is fragile like paper and also a new beginning – a blank sheet of paper on which history is to be written. American jewellers in 1937 also published a list of gemstones associated with each anniversary rather than just the later ones and flowers have also been associated with each anniversary – the first one being a pansy. The first London moonwalk took place in 1998 but its founder Nina Barough began the idea with a New York power walk in decorated bras back in 1996. All participants raise money for Walk the Walk which then grants money to different charities to help the fight against breast cancer. Our team raised a whopping £1800 which feels like a fabulous achievement, with me personally raising just over £730. My company are good enough to match the amount I raised and give it to their charity of choice which is CLIC Sargent this year; so I will also be helping children and young people with cancer. Anyone who has ever raised money for any charity will understand just how difficult it can be to get money out of people. You have to become a thorn in people’s side. 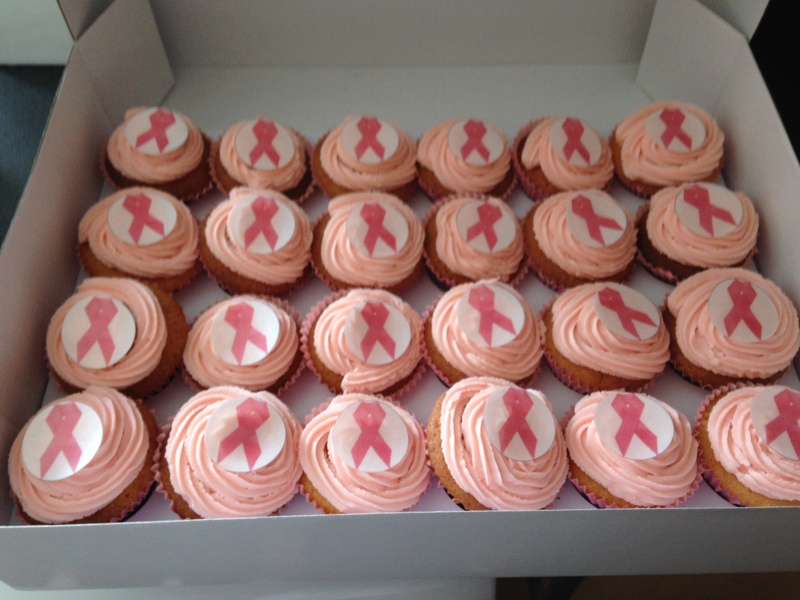 Other than simply asking for sponsorship, I made cupcakes which my husband sold at work to raise money. I don’t think any of us were prepared for just how tough 26.2 miles pounding the pavements of London would be, especially overnight. We had all put in hours of training although admittedly my sister in law was far more dedicated than my husband and I – our longest training walk was just over 17 miles. Walking during the day however is very different to doing it when your body is battling the natural urge to sleep. The first couple of miles passed relatively quickly despite the crowds (over 15000 people took part). There was lots of encouragement on the way round and it was interesting doing a tour of London’s tourist spots when much of it is deserted. Walking past my office at 1am on a Sunday morning is certainly something I won’t ever be doing again! About mile 18 it really got tough though and we all felt like we had hit a wall. There was some serious doubt amongst us as to whether we could finish. The thought of the money we had raised though, coupled with the terrible suffering those with breast cancer endure spurred us on through and we eventually completed it in about 9 ½ hours excluding lengthy toilet queuing time! As the medal was put round our necks – it all felt worth it. I had previously done the half moonwalk in 2013, see previous blog and was determined to prove to myself that I could do the whole one. I don’t think any of us will be rushing to sign up again but I would recommend anyone to do it at least once – it certainly is an experience and it really does make a difference. As many of you would naturally assume, most of Sunday (our anniversary) was spent sleeping and recovering and instead of a celebratory dinner out, my husband and I enjoyed Prosecco and a Chinese take away. His gift to me for our anniversary was a photobook of our honeymoon and mine to him was some Formula One books and a message in a bottle. 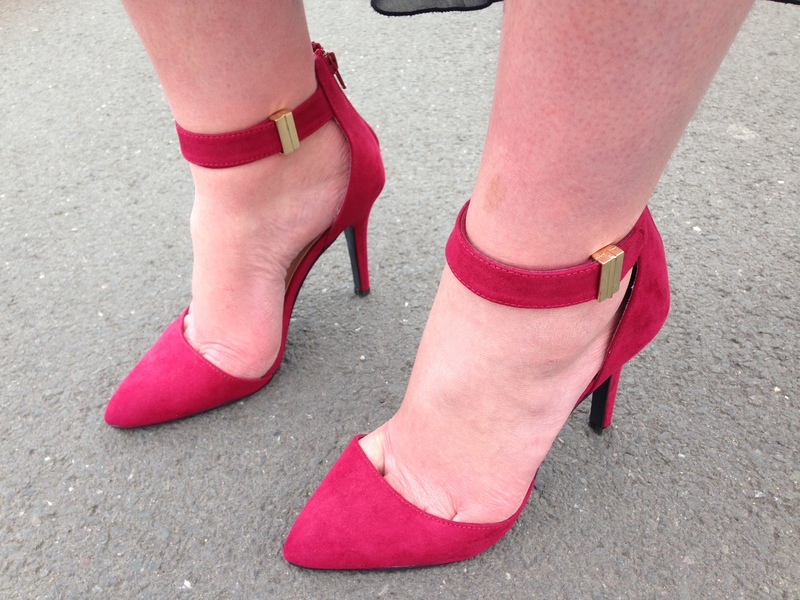 My friend suggested I reward my efforts on the walk with a pedicure and a pair of Louboutin’s! As a shoe addict I really should pay more attention to my feet so I took her advice and went to Amazing Space in Rochester the following weekend. An hour’s signature pedicure was £32 and included a hard skin removal, soak, exfoliating scrub, massage, cuticle and nail tidy and a polish all whilst sitting in a body massage chair with soothing music in the background. It was pure indulgence. Unfortunately my pocket can’t stretch to Louboutin’s but I did feel a new pair of shoes may be in order so bought a couple in New Look which I will feature on future blogs. Anyone who has done the correct training can do the Moonwalk so why not sign up for 2016 and challenge yourself – people with breast cancer will be thanking you. Work worries seemed a distant memory as Mum and I sipped champagne on our flight out to Heraklion, Crete and any remnants of stress were washed away as we were bathed in warm sunlight stepping off the plane. We had booked this trip some 10 months previous and I couldn’t believe we were finally there. 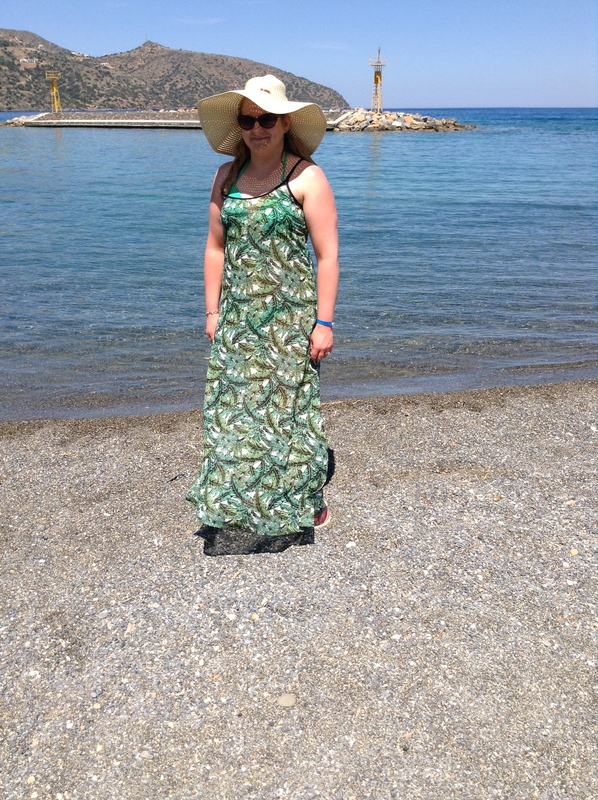 I had of course had a failed trip to Crete a few years earlier due to issues with my eye but finally I had made it. We had both left our husbands to fend for themselves for the week which I guess means Weatherspoon’s and local take away’s saw a rise in their profits! 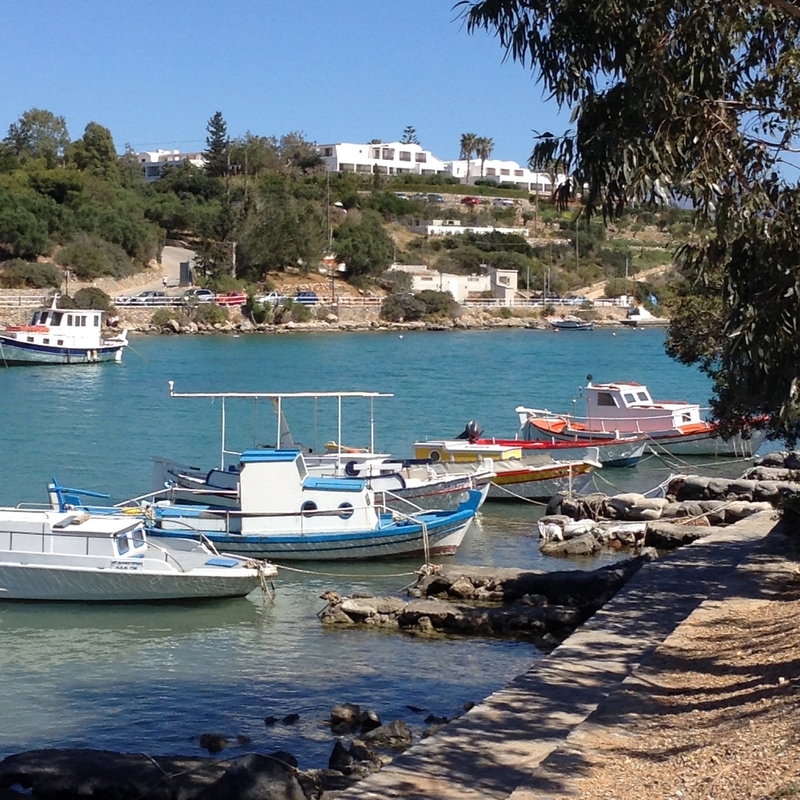 Crete is one of the largest of the Greek islands and also the only one which could support itself without tourism – predominantly due to its olive harvest. Weather in early May in Crete is generally good with temperatures in the early twenties. We enjoyed unprecedented temperatures and one day the mercury hit 32 degrees; however our final two days were cooler with a north-westerly wind sweeping in. 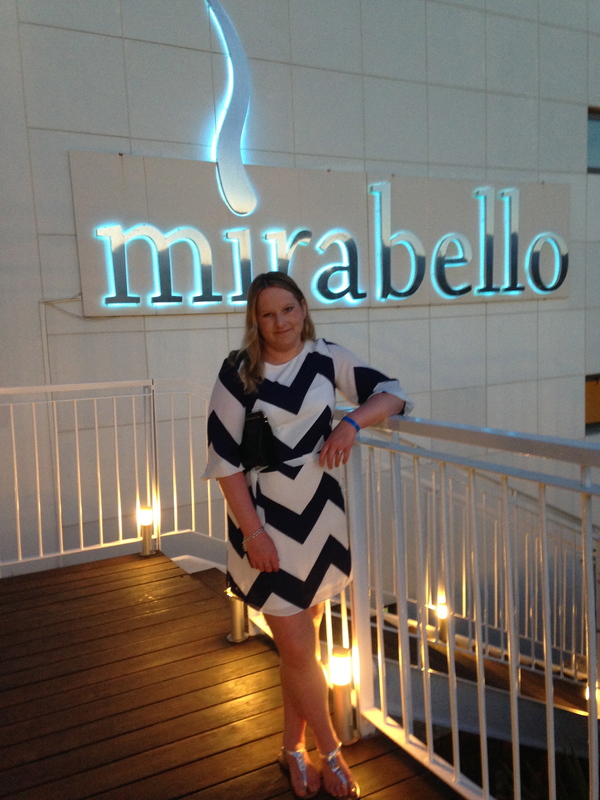 Our hotel, the Mirabella in Agios Nikolaos was a 4* plus and it really was stunning with infinity pools; one of which had a swim up bar, a spa and a private beach area. It would have been rude not to spoil ourselves at the onsite spa. We sat in the sauna and then relaxed in the Jacuzzi. I then had a hot stones massage which I have wanted to try for ages and Mum had a neck, back and shoulder massage. Prior to going into the treatment rooms we were directed to changing rooms where we were supposed to take everything off and then put on this horrid pair of paper knickers and a towel round us. Our therapists then met us and Mum had a male therapist – I don’t think I would have been comfortable with that but she obviously was as she fell asleep during the massage! 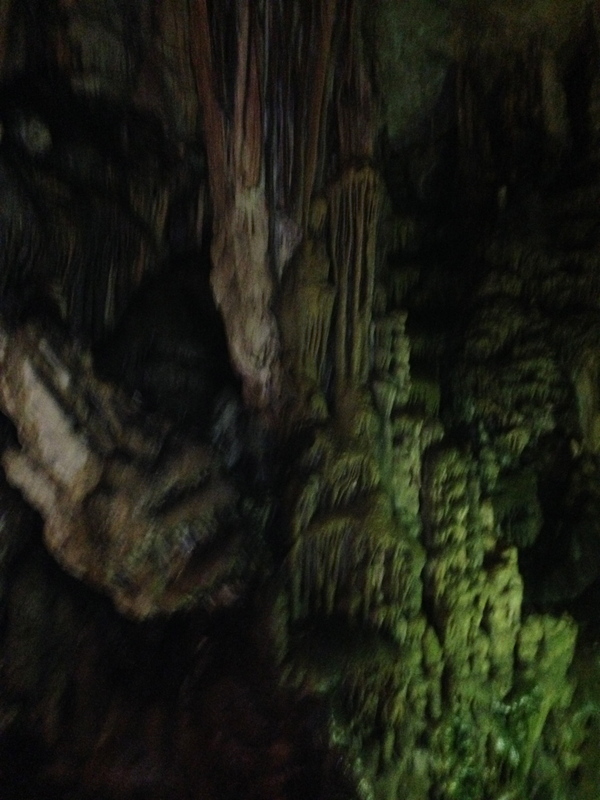 The hot stones were extremely relaxing and I felt all my tensions slip away. 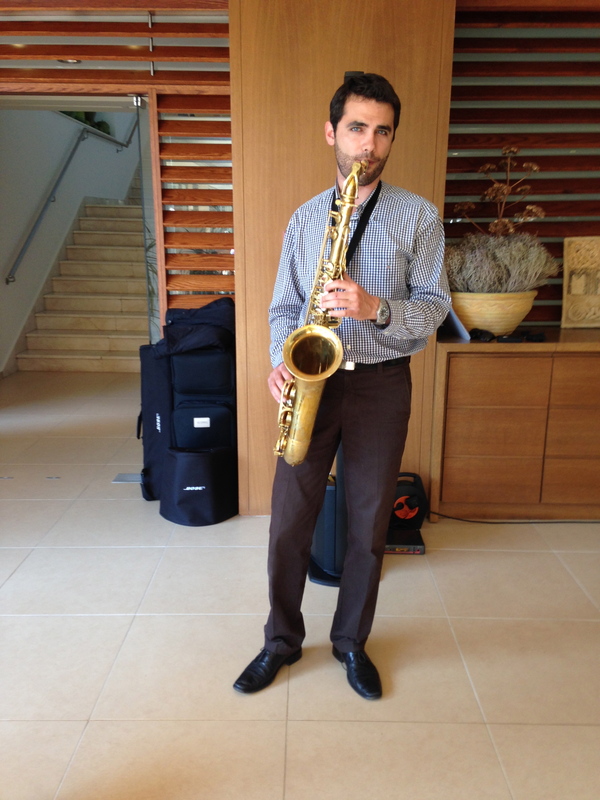 On our last morning we even had champagne for breakfast – very indulgent, whilst being serenaded by a gorgeous saxophonist. As part of our all- inclusive deal – we were entitled to one night at the a la carte restaurant. This was a 5 course meal so we were thoroughly stuffed when we left there. 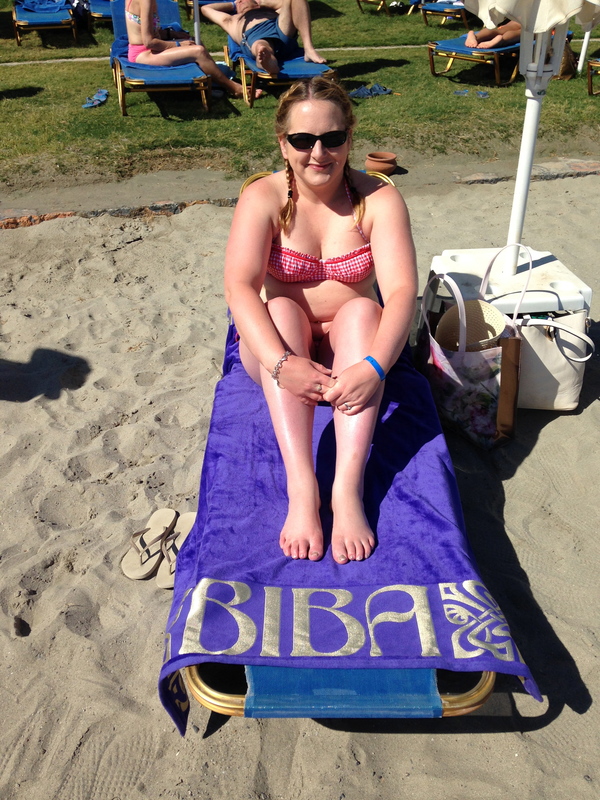 We could have spent the whole time sunning ourselves but judging by my sunburn – it’s probably a good job we didn’t. We got out and about quite a bit and immersed ourselves in the island’s culture and history of which its inhabitants are extremely proud, as well as enjoying some pampering and relaxation. Crete and indeed the Palace of Knossos which we visited, was the centre of the Minoan people who are believed to be one of the earliest European civilisations. 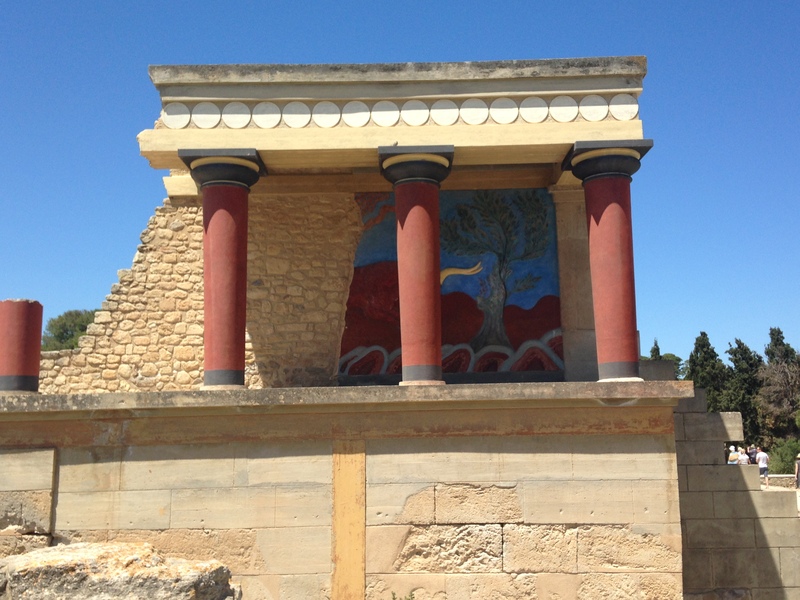 The ruins of Knossos were discovered by a British man in 1900 and he spent time reconstructing parts of it which is the cause of controversy among historians. It was a baking hot day as we were guided around the ruins by a very knowledgeable but over talkative guide. The visit was followed by free time in Heraklion and culminated in a visit to the Archaeological museum there which was intended to cement our knowledge of the Minoan people. I’m afraid museums of this kind are not really my thing – if you’ve seen one pot, you have seen them all, and so Mum and I sneaked off shopping after showing our face at the museum – what rebels we are! 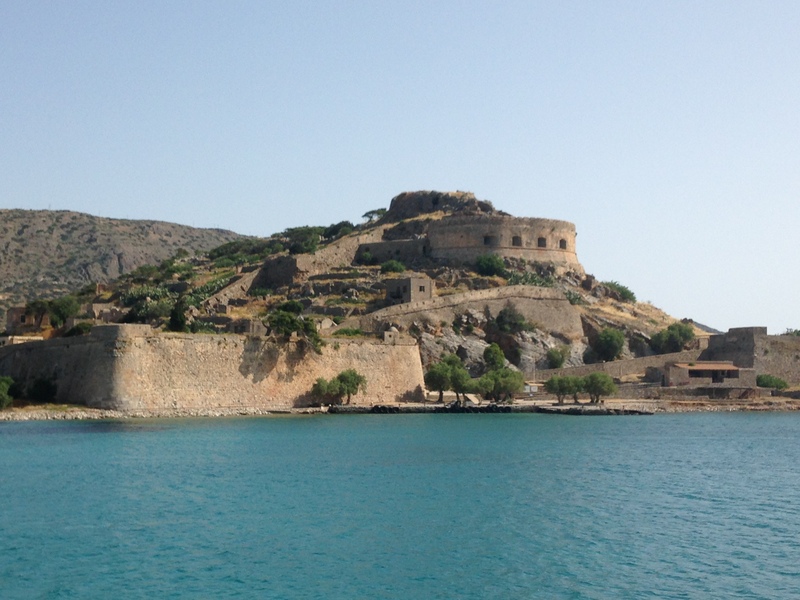 One of the main reasons we had chosen Crete for our holiday was to visit the island of Spinalonga. The island was originally used as a fortress in Venetian times but was used as a leper colony from 1903-1957 and was one of the last leper colonies in Europe. It has been uninhabited ever since. This sort of history is far more interesting to me as it is relatively recent whereas it is hard to visualise Minoan history which is thousands of years ago. Spinalonga was made infamous by the author Victoria Hislop who wrote the book ‘The Island’; a novel based around a fictional family’s experience with leprosy. I reread this whilst away and having now seen the colony – the story was even more captivating for me. 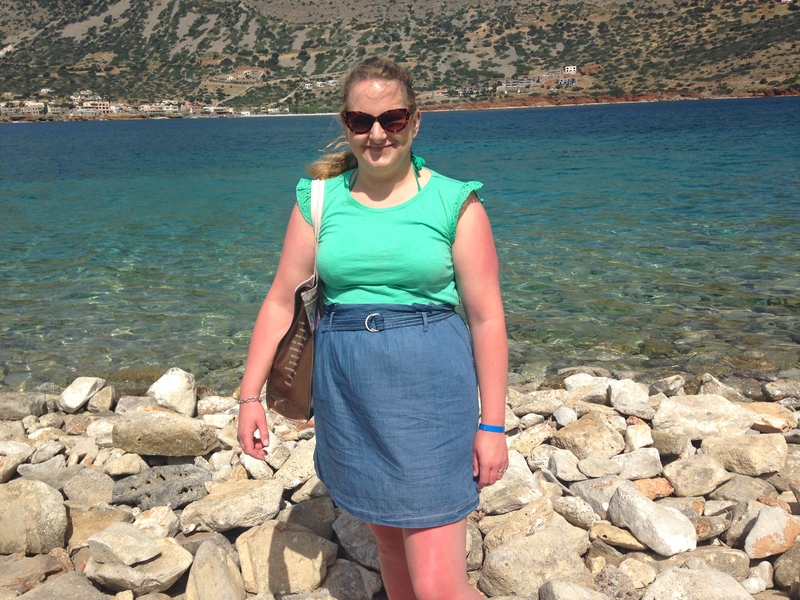 We also had free time in Elounda where we relaxed on the beach and enjoyed a Greek lunch. The highlight of the trip was a 4 x 4 jeep ride up into the mountains to the Lassithi Plateau. As we drove up the rough tracks, our driver pointed out to us herbs that grow naturally, tree climbing goats and vultures. We had a hearty BBQ lunch as part of the trip and then burnt it off with a trip to the Dikteon cave in which legend has it Zeus was born. To reach the cave we had to climb a rocky path for 800m and then descend 250 steps. 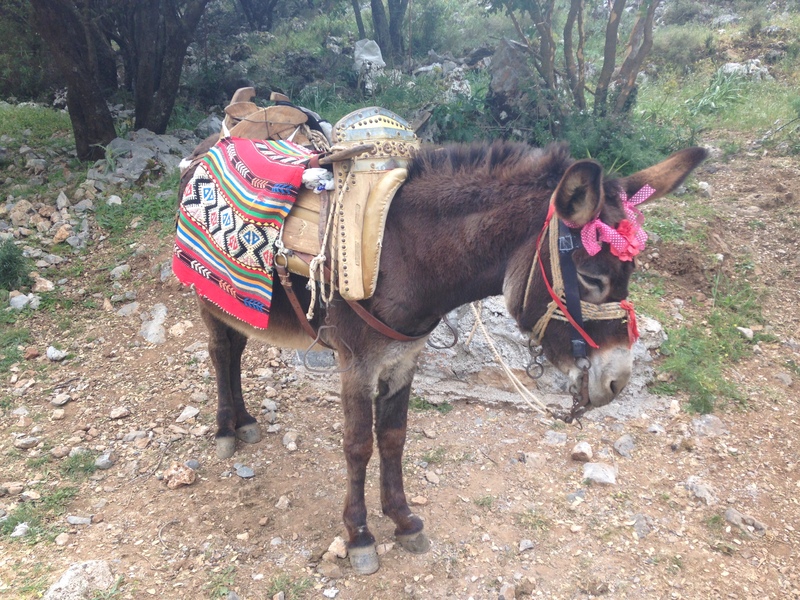 You could have opted to pay for a donkey but we were warned that these animals are not terribly well cared for, so not to fund it. The driver of the jeep was an expat but so knowledgeable about the many customs of Crete and the Greek people in general. 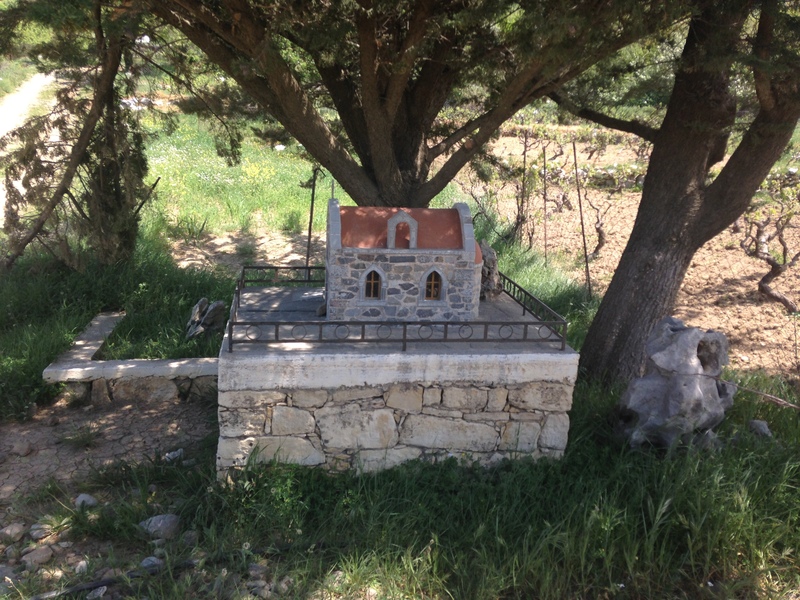 Some of the things that particularly fascinated me were the small churches left at sites of road crashes as a way of ensuring the souls of the dead go to heaven or thanking God if they survived. They are also placed by fields to thank the God for a good harvest. Another terribly romantic custom is that if a woman loses her husband, she wears black for the rest of her life and if a man loses his wife he grows a beard as a sign of mourning. 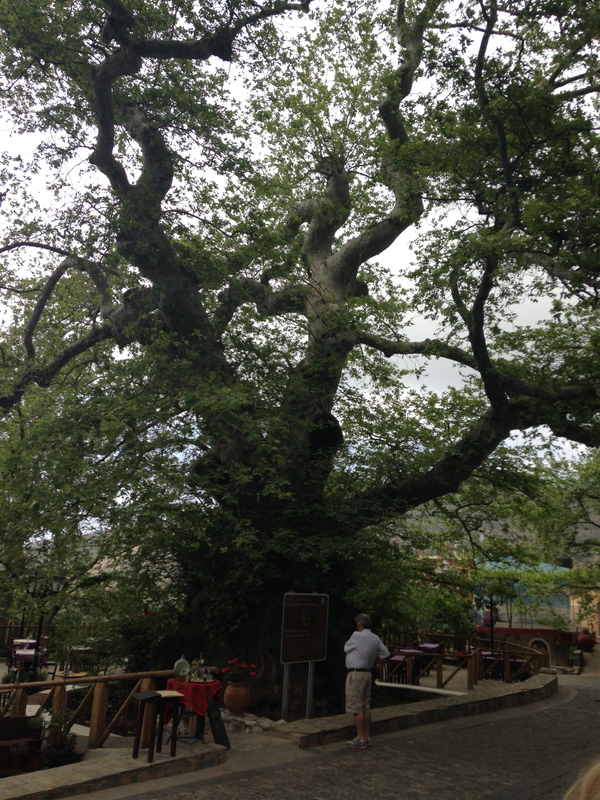 The day was finished with a visit to Krasi to see the oldest Plane Tree in Crete which is believed to be 2400 years old. It is thought to be the tree of Zeus. The tree is said to be a tree of fertility that will never die. Opposite the tree is a Venetian spring where washing would have been done. Mum and I also visited a local olive farm which was right near our hotel. 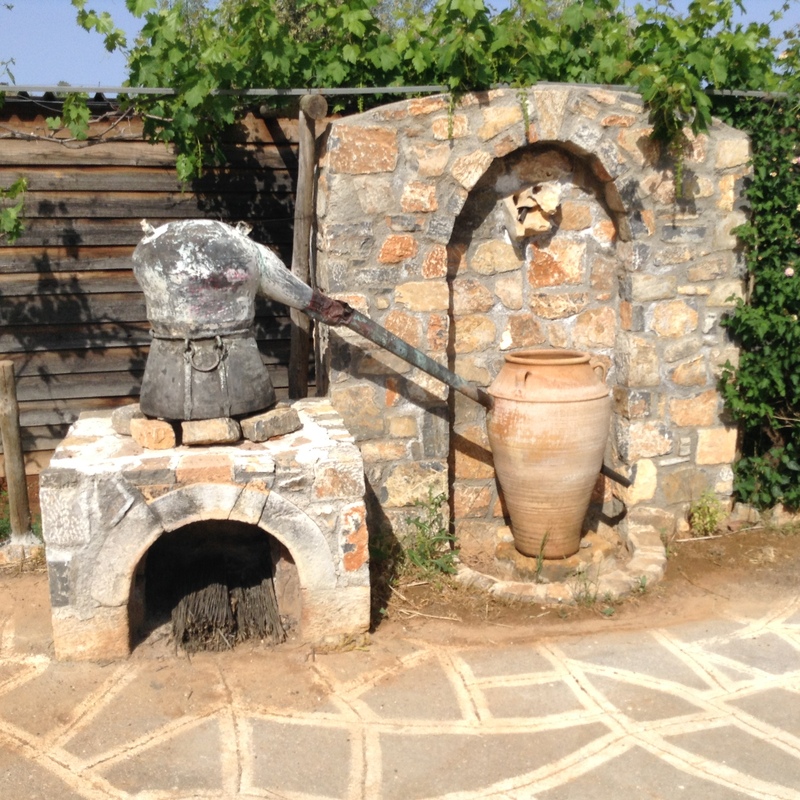 The farm had been in the owner’s family for years and he took us through the original process for making the oil and also showed us what else he produced including Raki and pottery. 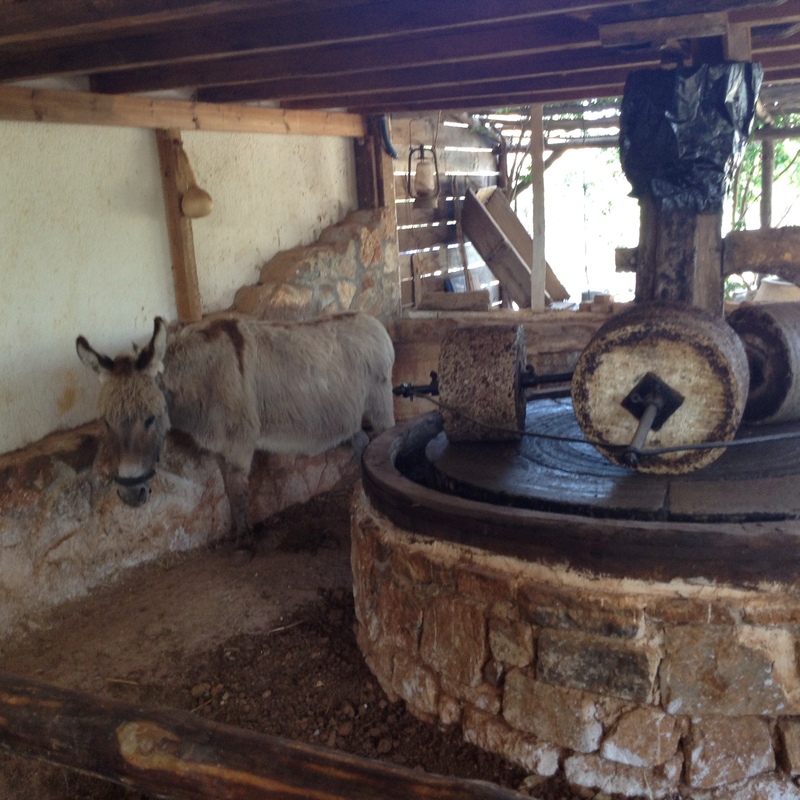 We then tasted the olive oil he had made by completely traditional methods apart from the grinding which was done by hand rather than by the donkey, who he keeps just as a pet. 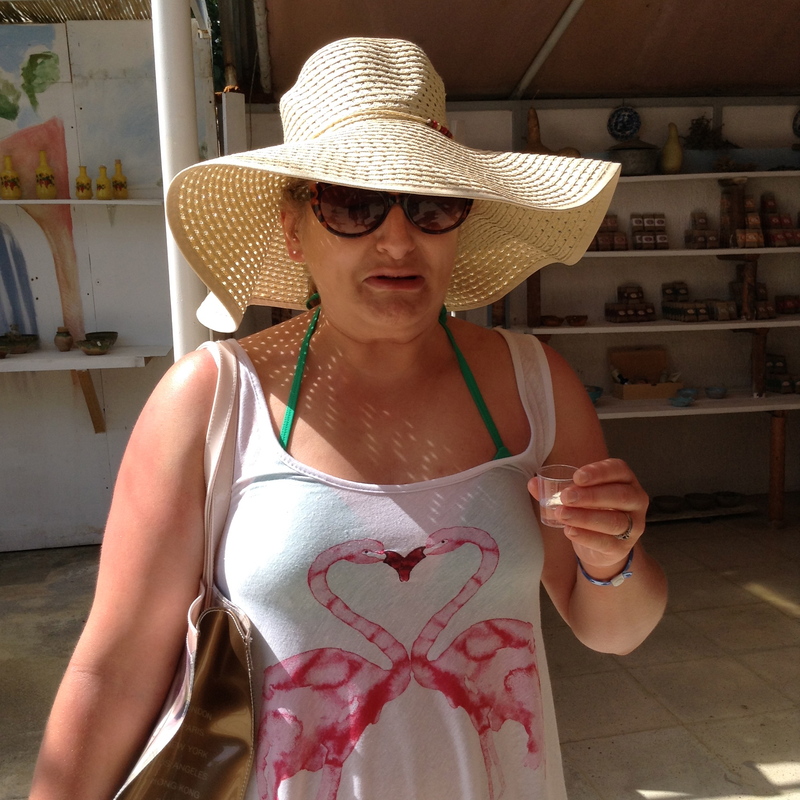 We also sampled honey and Raki. Raki is used as a bit of a cure all by Cretans and is often served at the end of a meal. Mum and I both tried it but neither of us were impressed. I purchased some olive oil from there and some sundried tomatoes. I usually like to add to my shoe collection whilst away but sadly on this trip, this was not meant to be. The first pair I liked in Heraklion were out of stock in my size and another gorgeous pair in Agios Nikolaos were out of my price range at €265! 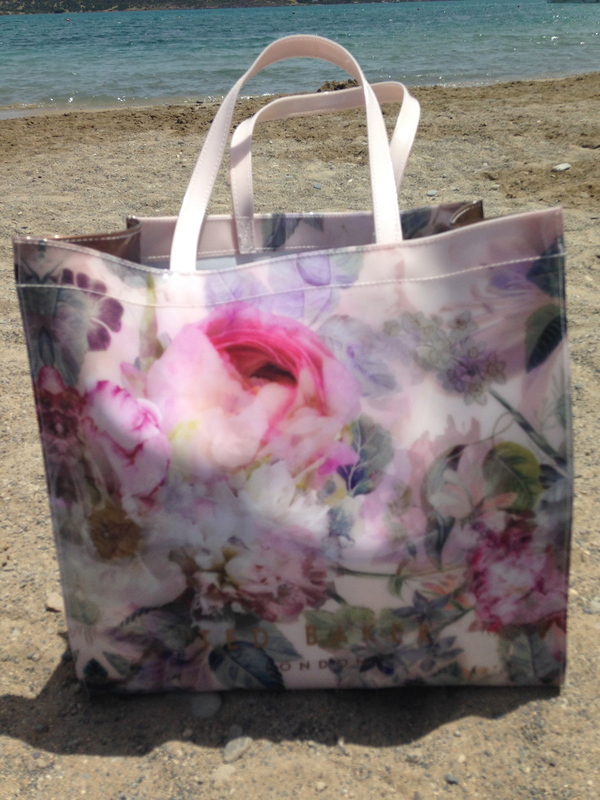 I did however make a few fashion investments apart from buying the usual holiday toot. Every jeweller we walked past on the island, attracted us to the window with a beautiful blue stone, which is more stunning than any I have seen before. 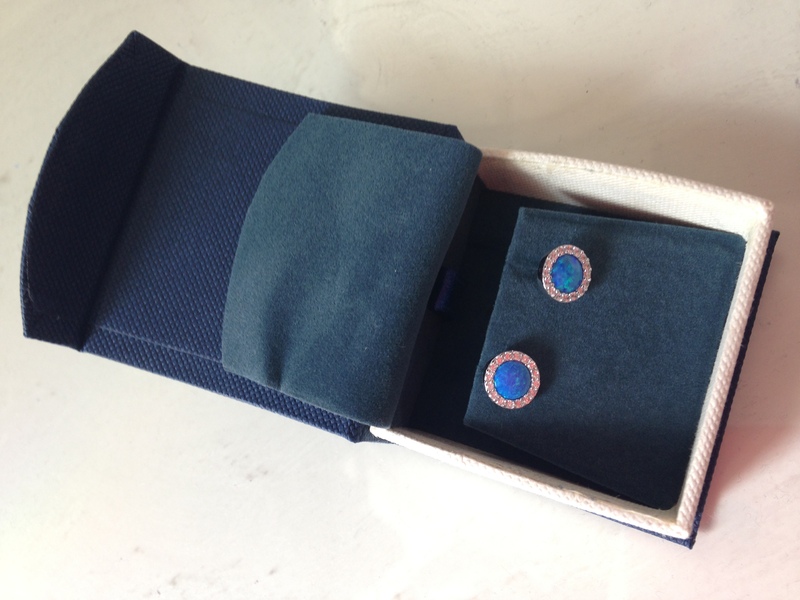 I couldn’t resist these earrings from a jeweller in the hotel and what was even better was the guy knocked €9 off the price, however he then waved at me every time I walked past his shop for the rest of the trip – either he had a thing for me or was trying to entice me back to spend more. 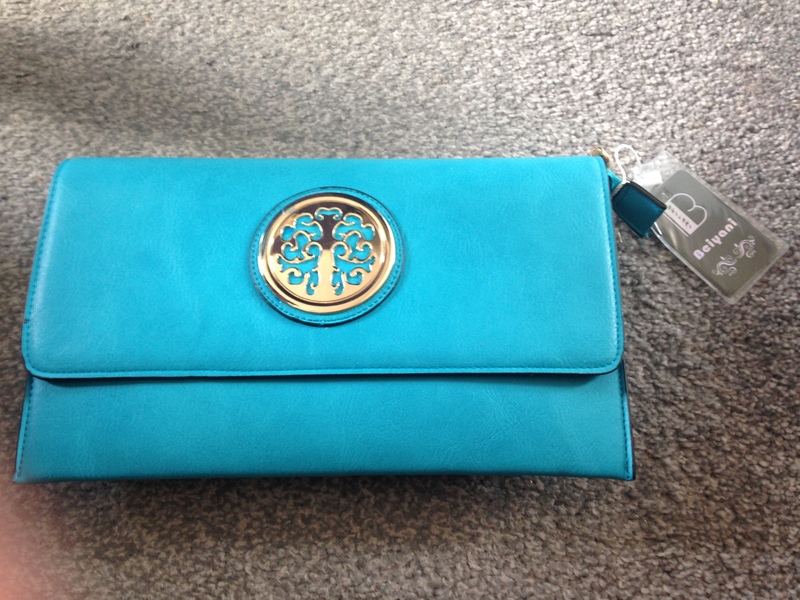 I found this gorgeous blue clutch in the market at Agios Nikolaos and couldn’t resist it. 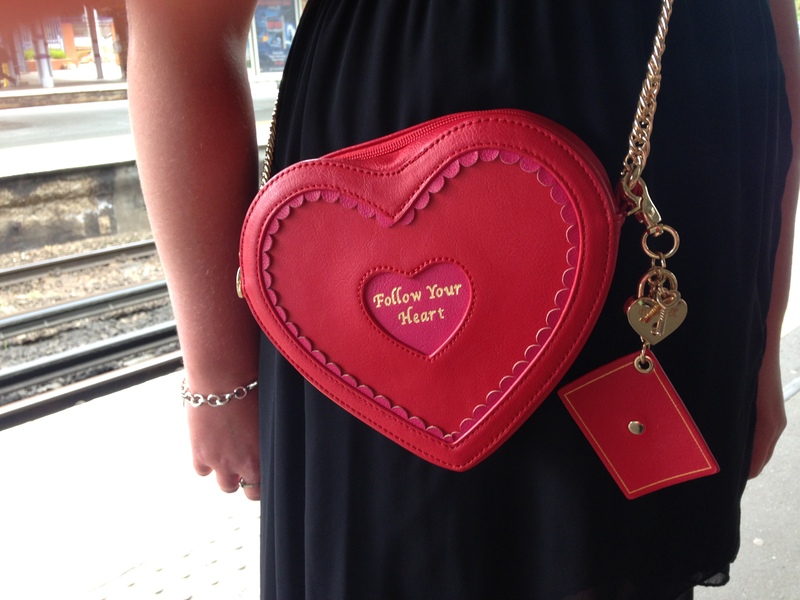 I thought the gold embellishment looked vaguely similar to that of a Mulberry bag with the tree. Getting shoes in the right shade to match will most likely prove an impossible task but I think you could pair it with navy or black shoes. 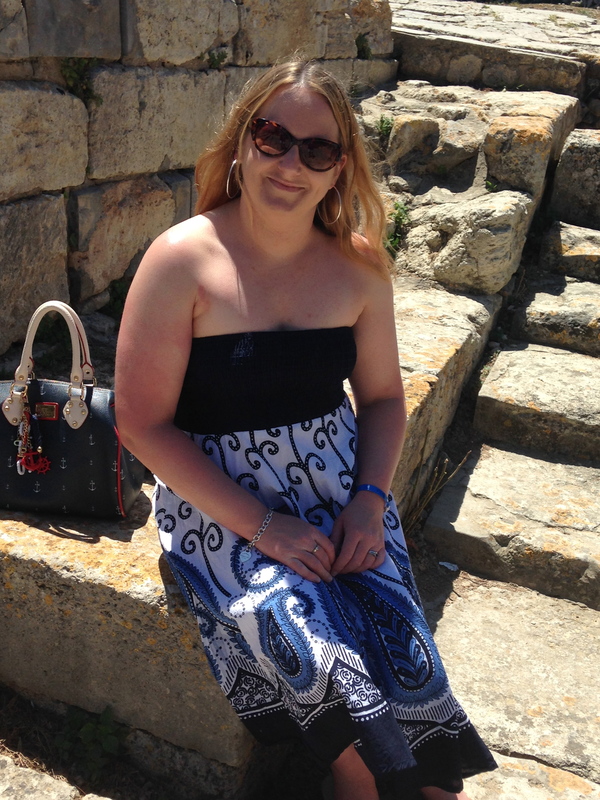 An eco zoo park where they showed how they traditionally made textiles and pottery brought me to a gorgeous cream pashmina which I know I will accessorize lots with in the coming summer months being that England has slightly cooler evenings than Crete. 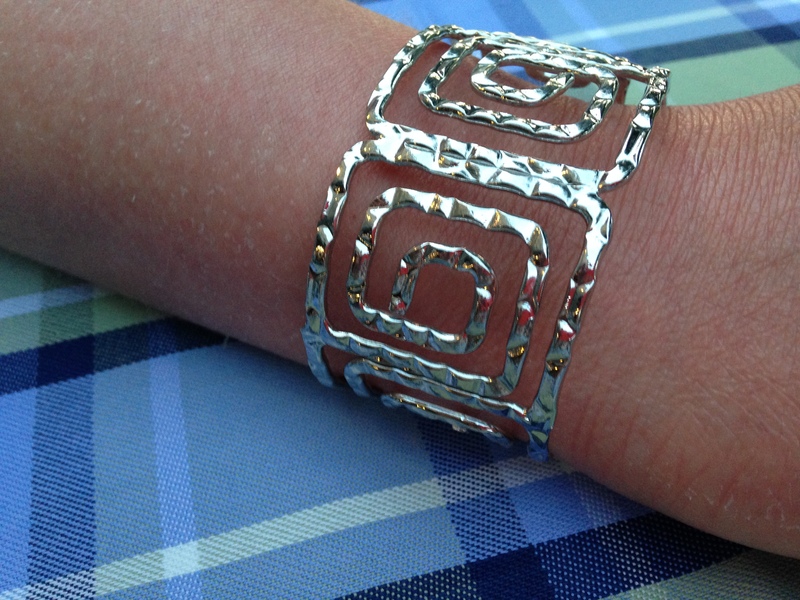 This bracelet which I found in a shop in Heraklion incorporates a well known Greek pattern and sets off any outfit a treat. 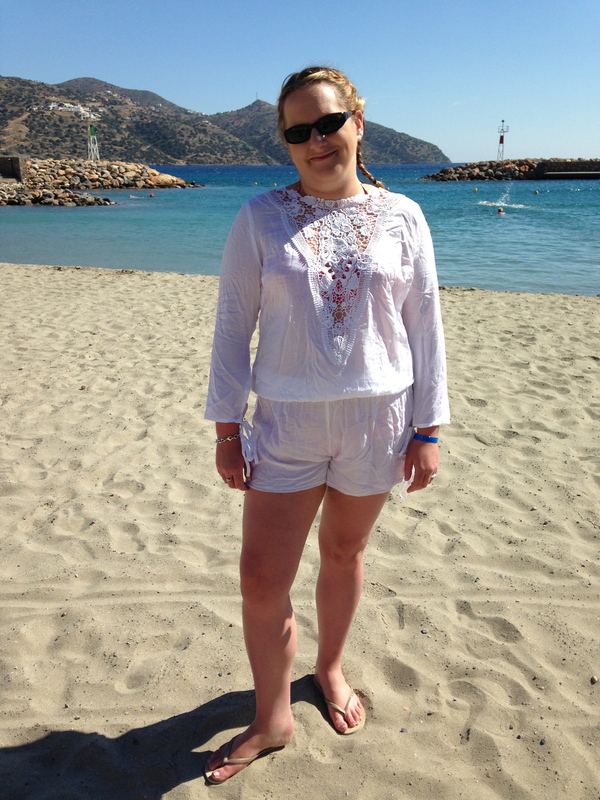 Of course before I went and at the airport I used the holiday as an excuse to expand my wardrobe and went a little crazy with beach wear – now I just need another holiday to get my wear out of it! 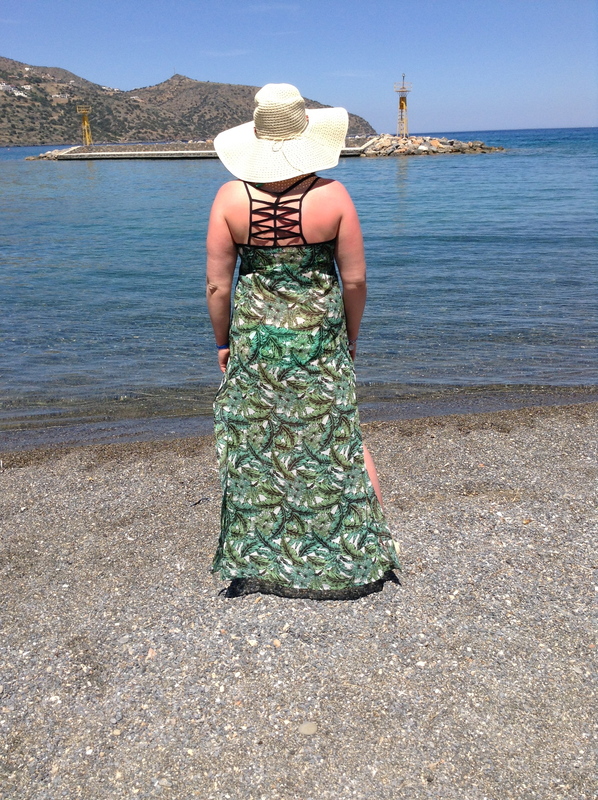 The intricate back of the dress – careful of the tan marks! 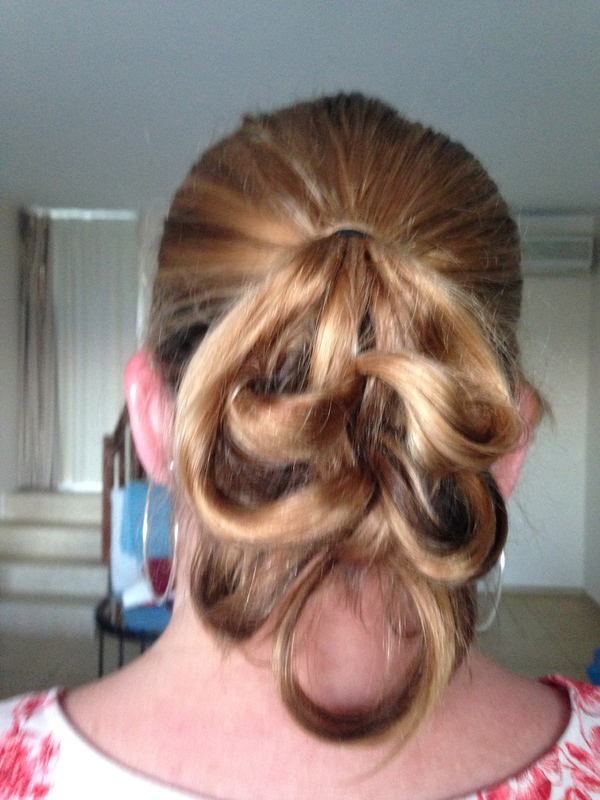 I also got Mum to test out a hairstyle I had seen a video for on Facebook and I will attempt to explain how to perfect it. The week went by in a flash and before we knew it we were heading back to the cooler climate of good old England. 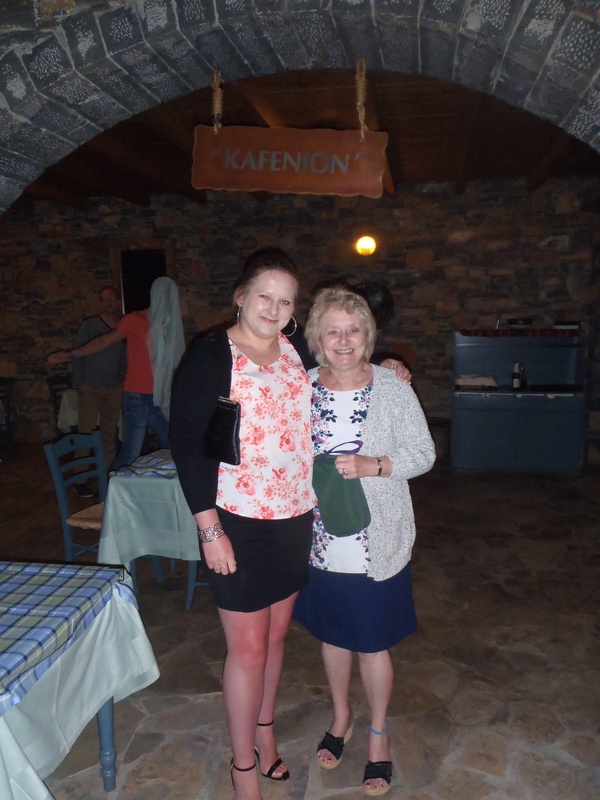 I certainly fell in love with Crete and would love to visit again and it was so lovely to spend quality time with my Mum who is also my best friend. I only hope if I have a daughter, my bond with her will be as strong. Love you always Mum.